KOKOMO, Ind. 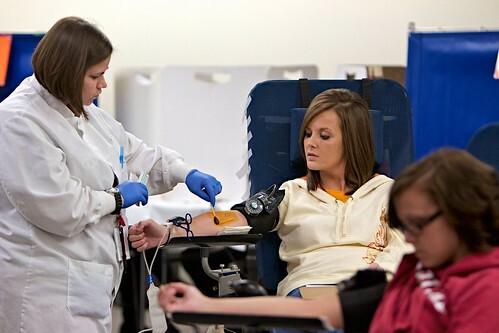 — The Indiana University Kokomo Alumni Association (IUKAA) invites you to come save three lives, with a donation of a pint of blood, on Wednesday, October 3, in the Kelley Student Center, room 130. IU Kokomo Alumni Blood Drive"Every pint of blood donated saves three lives," said Ryan Bowman, director of alumni relations and campus ceremonies. "We hope to be able to save hundreds of lives through the contributions of IU Kokomo's students, faculty, staff, and alumni." The IUKAA is teaming up with the Howard-Tipton Chapter of the American Red Cross to collect at least 70 units of blood. The blood drive will take place from noon to 6 p.m., and appointments can be scheduled online at www.redcrossblood.org, or in person from 11 a.m. to 1 p.m. now through Friday, September 28, outside the bookstore. Nationwide, someone needs a unit of blood every two to three seconds, and most people will need blood during their lifetime. The IUKAA and Red Cross will provide drinks and snacks during the blood drive. For more information, call Gail Daggett at 765-455-9457, or e-mail gdagget@iuk.edu.